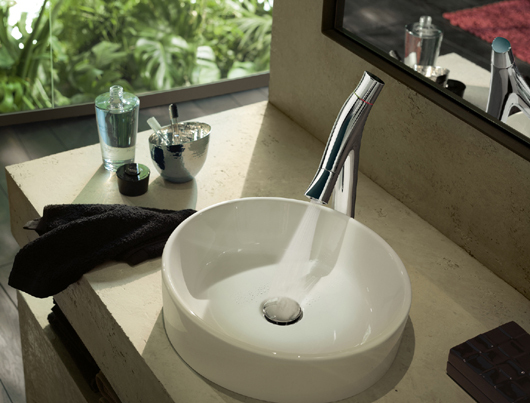 “To me, the essence of our work consists of allowing people to experience the fascination of water in its best way”, says Philippe Grohe, Head of the designer brand Axor, “and to provide innovative solutions of the highest aesthetic and technological levels.” The new Axor Starck Organic bathroom collection meets all these requirements. 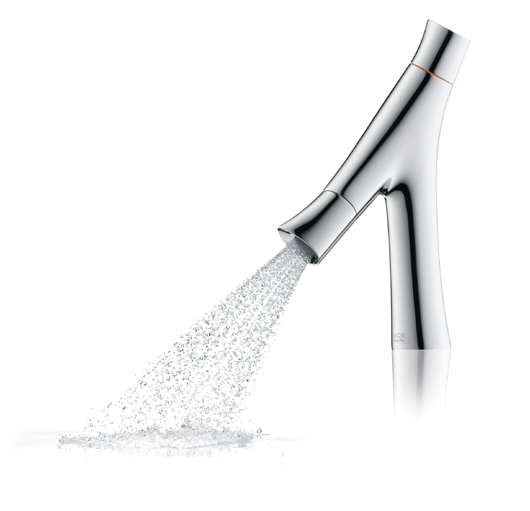 It was developed over a period of three years in intensive collaboration between Axor, the designer brand of Hansgrohe SE, and Philippe Starck. 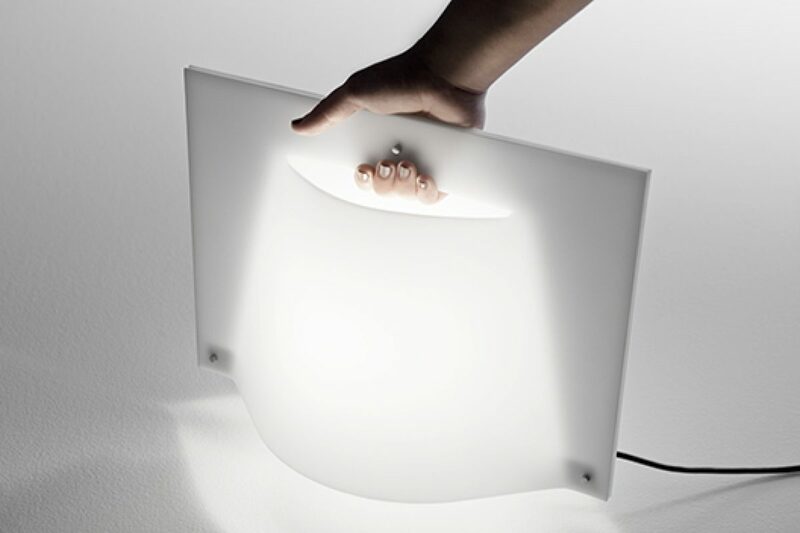 Focusing on the essence of things is what gave Starck the inspiration for this new collection. 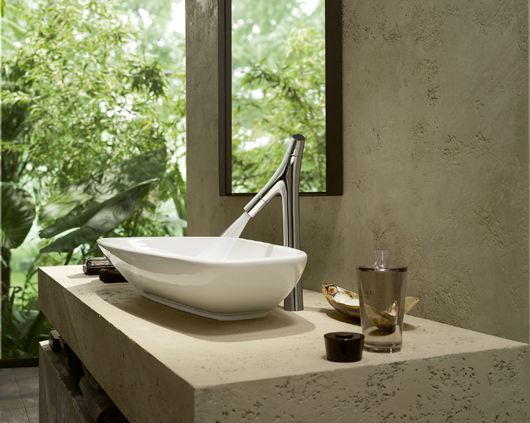 In its unique, organic-minimalist design, harmonious lines reminiscent of shapes we see in nature characterize Axor Starck Organic. They give the collection an exciting, powerful and sculptural immediacy. The two handles blend in visually with the body of the mixers. No matter what position the handles may be in – they will reflect a perfect image. Harmonious and ergonomical, they naturally indicate the current setting. Axor Starck Organic blends with the most diverse range of bathroom styles and will be a strong aesthetic highlight in any environment. Especially for the most frequently used wash basin mixers, the company’s spray research laboratory developed a new kind of water spray. Like a generous shower spray, it consists of 90 individual outlets, each producing countless gentle drops of water. This new and extremely efficient shower spray for the wash basin not only provides a new sensation; it is also more functional as it sprays a large surface area. With its pioneering new spray, the wash basin mixer from Axor Starck Organic sets a new standard: a consumption of only 3.5 liters of water per minute, without any compromises in functionality. Axor Starck Organic gives you the water you wish for – using less water! By comparison: on the international market, the standard for wash basin mixers is a flow rate of 7 liters per minute or even higher. Only three years after restricting the flow rate of their entire range of wash basin mixers to 5 liters per minute on average, Axor is extending the company´s pioneering role even further by achieving a generous flow at the rate of 3.5 liters per minute. The wash basin mixers in the new collection allow us to use water and energy intuitively, ergonomically and economically. Water flow and temperature are controlled separately. 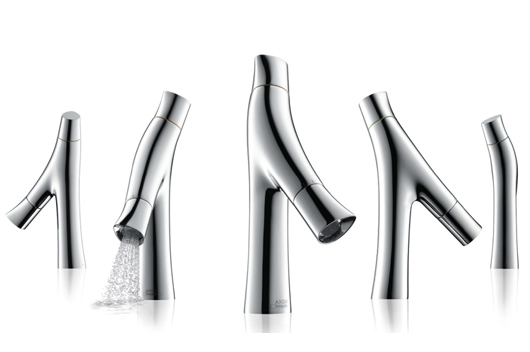 With Axor Starck Organic, the water is turned on and off at the end of the spout. This is ergonomic, because the hands are right where the water emerges. And not a single drop falls where it is not needed, not even onto the mixer itself. The temperature is regulated at the top of the mixer. There, it may remain at the energy-saving cold position or at any other preferred setting. If the user wants to change the temperature – which is not always necessary – then this is done in a separate action. 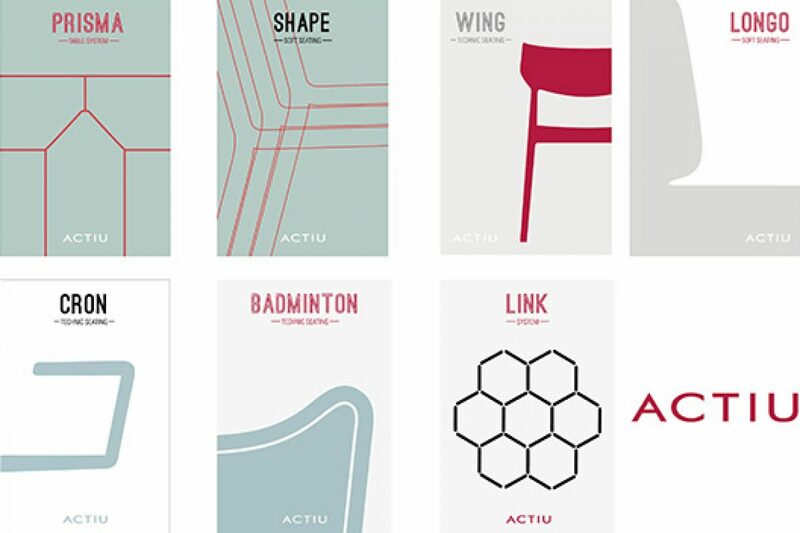 With Axor Starck Organic, less is more. A flow rate of 3.5 liters per minute without missing out on comfort means: the responsible use of water is becoming the positive norm. If a stronger spray is required on occasion, the flow rate can be boosted up to 5 liters per minute. Thanks to the special construction of the mixer, the walls of the basic body can be cast using about one third less brass – and hence consuming considerably less energy – than a conventionally produced model would. Decoupled water conduits inside the mixer prevent direct contact between the water and the body of the mixer. 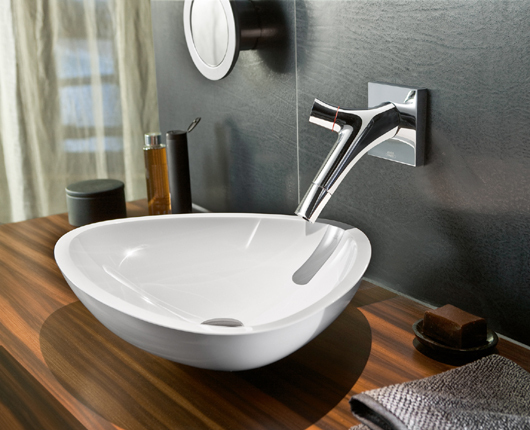 Like all Axor mixers, Axor Starck Organic is manufactured exclusively at the Axor plant at the Hansgrohe headquarters in Schiltach in the Black Forest. This plant is considered one of the most advanced of its type, not least in terms of its sustainability performance. For Axor, “Made in Germany” is about more than just the location, however: it stands for the ultimate in quality and workmanship, in the best sense of the word. 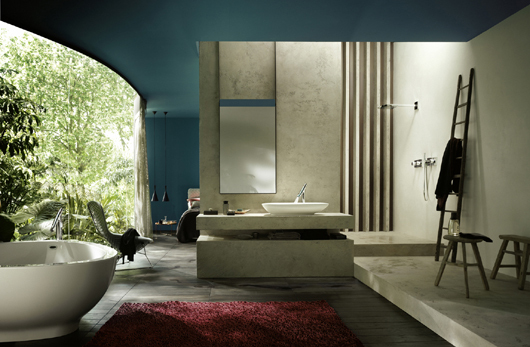 The Axor Starck Organic collection consists of more than 40 products, covering all areas within the bathroom. Mixers for the wash basin come in four different heights and a wall-mounted solution. 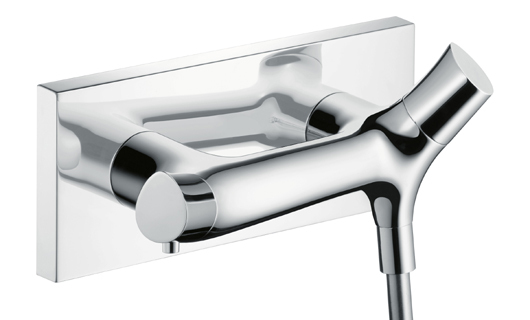 Mixers for the shower and bath tub focus on thermostatic technology for exposed and concealed-mounted solutions. 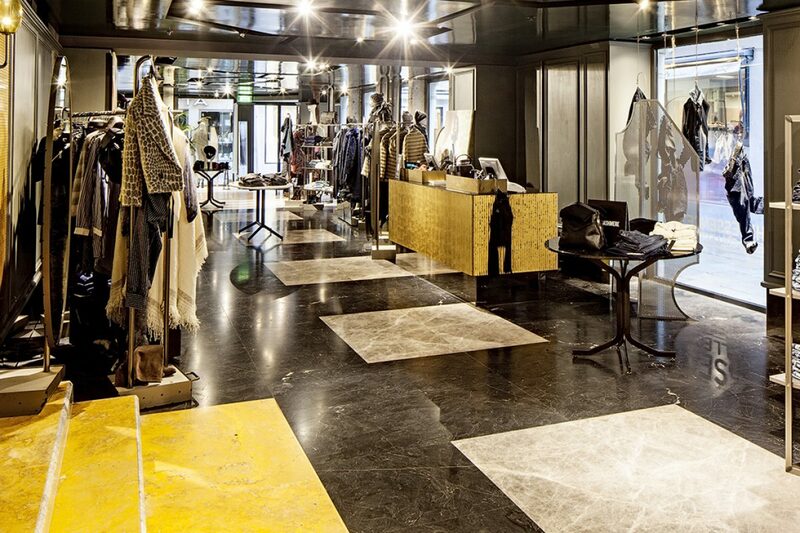 The collection is complemented with a range of accessories. The mixers bring a strong highlight to the bathroom and blend harmoniously with the most various environments: “Nature is right at home everywhere!” comments Philippe Grohe. In combination with collections such as the Axor ShowerCollection with Philippe Starck, Axor Starck Organic is ideal for creating strong highlights. 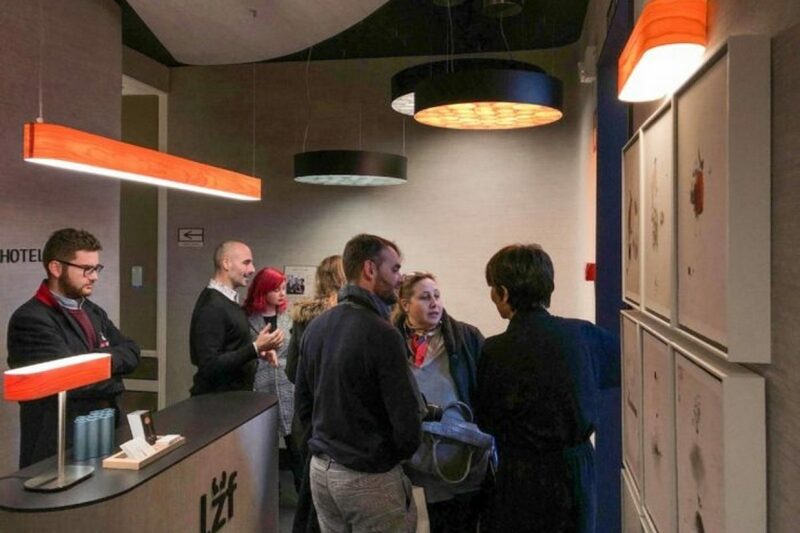 “In our very first discussions about this new project, it was already clear to us, that we were aiming for a new way to use water in a responsible way”, recalls Philippe Grohe. And Philippe Starck adds: “This collection is yet another revolution, a new cocktail of highest technology and good philosophy.” Axor Starck Organic shifts our focus on the essence of things, highlighting their sensuality and beauty, and touching both our heads and hearts.